Taipei Travel Guide - Where To Go In Taiwan ? If you’re going to visit Taipei, Taiwan for the 1st time, you will find many beautiful places to make the most of your stay. Although there are many lovely historic neighborhoods, here are my favorites places to visit on my first Taipei trip. You can use this article as your Taipei travel guide for your 1st vacation trip to Taiwan. Taipei, generally known as Taipei City, capital of Taiwan (officially called “ROC” the Republic of China ). Almost all of the town is situated in the Taipei basin, a historical lakebed. The basin is outlined by the relatively narrow valleys of the Xindian and Keelung rivers, which meet along the western border of the city to the Tamsui River. The town has an approximated population of 2.7 million. The city is a financial, political, educational and cultural hub of the country, therefore, every visit to Taiwan must start here. When is the Best Time to Visit Taipei, Taiwan? While setting up a holiday trip to Taipei, automatically comes in mind how is the weather in Taipei, Taiwan. Of course, Taipei does not have immense temperature fluctuations, such as European or North American cities. In general, Taiwan enjoys a mild climate throughout the year, with an average temperature of approximately 23 ° C (73 ° F). May to September are the rainy months, while June to August typhoon season is high. From October to March weather in Taipei is very pleasant. It is the driest period of the year, and also the temperatures are reasonably moderate. If you want to enjoy the cherry blossom time spring is the best time. April to September are more humid, warmer and rainier months, in my people should avoid visiting in these months. The temperatures are often over 30 ° C in the summer and are also unpleasantly moist. Before you leave check out current time and Weather in Taipei, Taiwan. The vast majority of tourists to Taiwan will get there by plane. Taipei has two international airports, Songshan and Taoyuan, however, nearly all of the worldwide flights are served by Taoyuan airport. You can reach the city from Taoyuan Airport via MRT, bus, taxi or private transportation. Always Compare cheap flights to Taipei before booking. Address: No. 211, Guangzhou Street, Wanhua District, Taipei City, Taiwan 10853. Start your day with the sunrise watching on Mengjia Longshan Temple located in Wanhua District, Taipei. Constructed in 1738 by immigrants from China, Fujian, it withstood fires, earthquakes, along with other natural disasters. 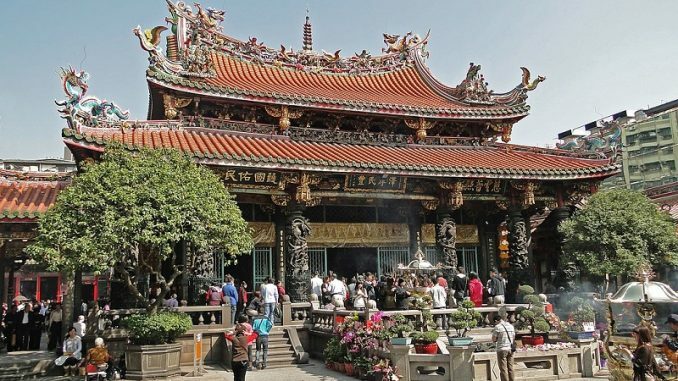 Tourists can explore the reconstructed corridors with religious objects and traditional works of art as they learn about Taipei’s Buddhist and Taoist traditions. Address: No. 7, Section 5, Xinyi Road, Xinyi District, Taipei City, Taiwan 111. The Taipei 101 Observatory is open daily from 9:00 am to 10:00 pm and costs $ 15 or NT$ 500. Taipei trip at Taipei 101, this skyscraper is situated in the District of Xinyi, in 2oo4, this 1,671 feet high building was named the tallest building in the world. The Taipei 101 kept the title for six years until Burj Khalifa in Dubai announced the tallest building in the word in 2010. The tower has 101 floors and on the 91st story, an outdoor terrace, similar to the Empire State Building in New York, offering the breathtaking view of the town. Five lower levels of Taipei 101 has a luxurious shopping center with luxury stores like Louis Vuitton and Burberry. Indoor observatory On the 88th story, you can watch the 730-ton damper, basically a big ball that works like a pendulum to keep buildings from swinging with strong winds. Without this shock absorber/damper, people on high floors may suffer from dizziness due to the constant movement of the tower. Taipei 101 is a landmark of the city, which is visible from miles around the city. Every year Taipei 101 draws in tens of 1000’s of tourists to see the impressive fireworks show. Address: No. 221, Sec 2, Zhi Shan Rd, Shilin District, Taipei City, Taiwan 111. If you like history, this is the place for you. At the National Palace Museum, you can spend a few hours exploring extensive collections and beautiful scenery on an area of 198 acres on the outskirts of Taipei. Museum has an enormous variety of 700,000 permanent items on Chinese imperial historical background and artwork. A very popular object with its collection is jade. Carved in the nineteenth century, it is a piece of jade carved into the head of the Chinese cabbage that hides a locust and a grasshopper in the leaves. After a walk in the museum, enjoy the true Taipei high tea in the Eclat’s comfortable lounge at Hotel Eclat between 14.30 to 17.30. Taiwan is all about night markets and has the best nightlife in the food markets. Raohe night market and Shilin night market are the most popular in Taipei. The area was a commercial center where agricultural material and products exported to other towns and cities such as Dadaocheng or Banka. Shilin has been in business since 1909. Since then it has become a place that adds flavor and color to Taipei’s nightlife. Besides the main food hall, the market has also flooded the surrounding streets with over 500 shops. It’s a great place to taste mouth watering and cheap street food dishes. The Raohe, one of the oldest and most traditional markets of the city, covers an area of 2000 feet and includes much more than just food. In winter enjoy the herb-steamed spare ribs, or try other delectable market specialties: pork feet noodles, bubble tea, pepper meat buns, oyster noodles. The park is for people who look forward to beauty while traveling. It is the largest natural park and popular sightseeing destination in Taipei, at a short bus ride from the city of Taipei. The Yangmingshan National Park has no entrance fees. However, if you are arriving by car, you might have to pay for parking. National Park is ideal for hikers and has many routes that can last from just two hours to an entire day. Along with others, Seven-star Peak is one of the famous trails, which takes you to the highest peak in Taipei at (3600 feet) 1120 meters. Yangmingshan Flower Festival starts from February to March every year, When different kinds of flowers along the camellias, azaleas, and especially the cherry blossoms reach their maximum splendor. In each evening of the festival, cherry blossom trees are decorated with a special romantic look. Between the view of the city and the beauty of cherry blossoms, Yangmingshan is a famous romantic place for lovers of Taipei. Another historic landmark in Taipei. You might have seen people posting selfies on social media with white and blue gates in the background. The Chiang Kai-shek Memorial Hall was constructed in honor of former President and General Chiang Kai-shek. 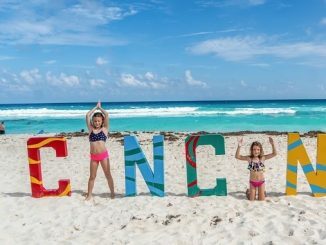 It is the most popular destination among foreign travelers. There is a great statue of Chiang Kai-shek at the Great Hall, such as the Lincoln Memorial in Washington DC. The pagoda-style memorial hall houses a presidential library and a museum on the ground floor. The surrounding Freedom Square and The monument hall covers an area of 60 acres, including many lakes and garden areas. Here, there are also two art buildings in Taipei, the National Concert Hall, and the National Theater. One of the most popular volcanic hot spring collections in Taiwan is in the Beitou district, known as Geothermal Valley or Hell Valley. Tourists originate from around Asia and all over the world to enjoy the healing waters of Taiwan’s natural warm springs, located in the near vicinity of Taipei. When you enter the valley, you will understand how it takes its name. A ubiquitous sulphurous mist spreads throughout the air with clouds of very hot steam floating from the cracks hidden in the ground. These warm spring pools reach up to (100 °C), making it very hot to swim here. To try out the healing waters in Hell Valley, head to Beitou Hot Springs, a hot spring source that provides a more comfortable temperature. In New Taipei City, Tamsui Fisherman’s Wharf is an idyllic place on the Northern side of the Tamsui area. Not only the Fisherman’s Wharf offers affordable seafood in restaurants, but also offers fantastic views of the solstice. It is a popular tourist spot known for some points of interest, for example, Fort San Domingo, Tamsui Old Street, and Lover’s Bridge. Taipei, Taiwan, is famous for the variety of shopping streets, stores, and shopping centers. In East Asia, it is considered one of the main commercial cities such as Kuala Lumpur, Tokyo, Singapore, and Hong Kong. 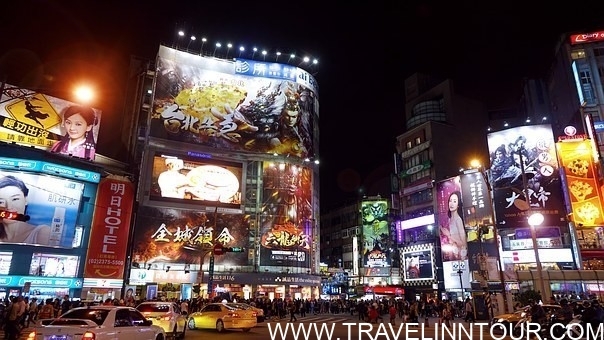 Ximending is a commercial area of Wanhua province in Taipei, If you are a shopping lover this is the place for you also known as the fashion capital of Taiwan. The area is full of boutiques, modern stores, cafes, and restaurants. At the weekend it becomes a pedestrian shopping center, and the streets of Ximending are closed for traffic. This place is famous for all types of street performers and, as in a hotspot, you can watch live concerts, album releases and also other events. Taipei is a big modern, clean city, but easy to manage. Easy to travel, there’s an incredible choice of street food and restaurants, night markets with an endless range of exciting dishes. Mama Lau Rice Balls: Mama Lau is a very economical and popular point to have breakfast (takeaway only). You will see a long queue in the morning, where people take breakfast while heading to work. It is a famous rice dish, considered as one of the national dishes, generally available all over Taiwan. However the flavor of this dish could be different area to area, the basic ingredients are, same, minced pork, soy sauce and steamed rice. There is a large selection of rice balls most commonly filled with pork, and you can make a choice from purple or white rice, even with options to add cheese! These are so tough that’s why its called Iron egg. These small chewy eggs, dyed black in soy sauce, are an extremely addictive Taiwanese food. Generally, quails’ eggs, are used, cooked for hours and dried in air. The process is repeated for many days until these protein balls become tough and the necessary chewiness takes place. Selecting a place and best location in Taipei to stay is considered the keys to the success of your trip. But to be very frank, Mrt is very useful as well as public transport, so it is actually doesn’t matter where you are staying. The Ximending area is the heart of Taipei’s shopping, entertainment, nightlife and affordable place to stay in Taipei. But you do your research as well before booking any hotel in Taipei. Airline Inn is conveniently located in the Ximending area and promises a relaxing and wonderful visit. The Taipei Energy Inn is one of the best hotels in the city. 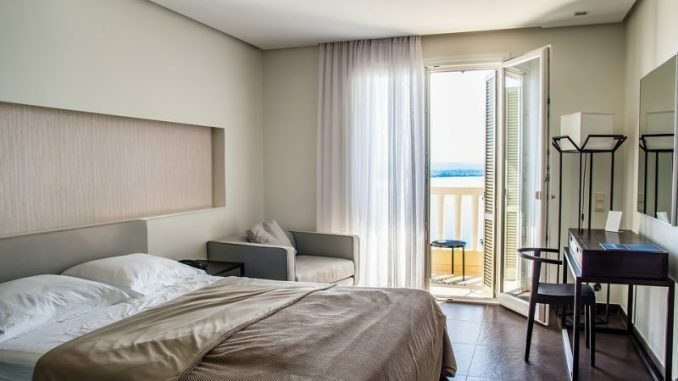 With a complete list of facilities, guests will find their stay in comfortable accommodation. Take a break at Li Duo Best Hotel to explore the wonders of Taipei. At a walking distance from Ximen MRT station and Ximending market. Click here to search and compare prices for all districts wise hotels in Taipei. Thank you for reading this Taipei travel guide, hope that it will help you plan your trip to Taipei.